Need Kids Vitamins? My daughter likes gummy vitamins like these (on sale) on Amazon! 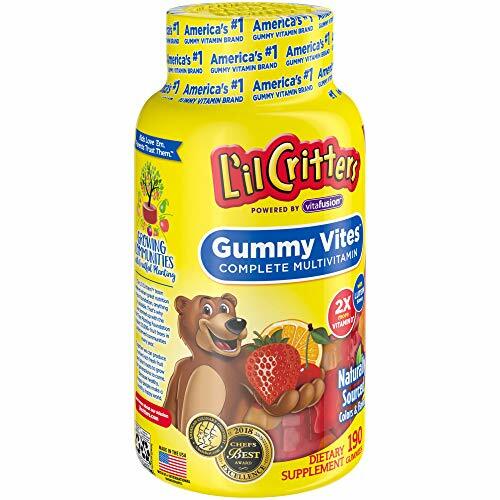 Hurry and get the L’il Critters Gummy Vites Complete Kids Gummy Vitamins, 190 Count today for $8.88 NOW as low as $4.10 from Amazon when you clip the $3/1 coupon & choose Subscribe & Save with at least 5 subscriptions in one month. Save BIG! (Amazon Prime members save 20% on diapers, baby food, vitamins & other subscriptions, compliments of Amazon Family – which is Free for Prime.) There is no commitment with Subscribe & Save. You can cancel at any time! Plus, get free shipping!! Details here! Check out all of the recent Amazon deals here! Want it sooner? Choose one-time purchase, clip the coupon & pay $5.88. Get FREE shipping (2-day for Amazon Prime members) when you purchase $25 or more of eligible items across any product category. #1 Kids Gummy Vitamin Brand  Kids love the great taste, naturally sourced flavors and the fun gummy bear shape. Parents can trust that kids are getting essential vitamins and minerals to support and maintain healthy growth and development. Based on 52 weeks Unit Sales, Nielsen All Outlet Data, through March 2018. These statements have not been evaluated by the Food and Drug Administration. This product is not intended to diagnose, treat, cure or prevent any disease. The ChefsBest Excellence Award is awarded to brands that surpass quality standards established by independent professional chefs. Buy the L’il Critters Gummy Vites Complete Kids Gummy Vitamins, 190 Count from Amazon. Next articleSquoosh-Os Galaxy D.I.Y. Stress Ball – Low Price Alert! !